Some Interesting Places in Beijing at China to Visit! The Summer Palace was of the Ming Dynasty. This was pretty much a place to be. Well we never did ride on the marble boat and sad to say, there were some Chinese swindlers but they were fortunately apprehended by the police guarding the place. That's been a lot of decent law enforcement in China. I thought it was a pretty interesting place and it was also near the Ming Tombs which gave me a yawn. 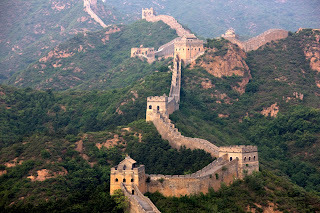 The Great Wall of China was built by thousands of slaves under the rule of Shih Huang Ti. The whole place was a big marvel, sadly it was built by slaves. Some say it can be seen from the moon. What I thought about the whole place upon arriving there was there were interesting souvenirs and of course, it was a spot for climbers. I may not be the athletic type but I pretty much dared to climb up to the finish line. Every last spot was a breathtaking thing for my camera. I didn't think I would reach the finish line and I had my Chinese name engraved on a medallion after that. Tiananmen Square was pretty close to the Forbidden City. 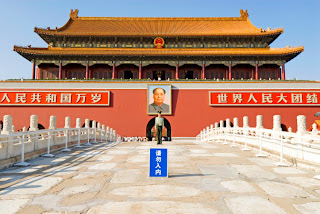 I just had a thought looking at the mausoleum of the late dictator Chairman Mao was something. This was once the place where the infamous Tiananmen Square massacre happened. Apparently, Mao is still remembered despite his failures during the Great Leap Forward in here. I had to be careful not to talk about Chinese politics here. After all, Beijing is also the very heart of the government. Well here's the Forbidden City which really was once forbidden to commoners during Imperial China by the members of the Chinese nobility. Nobody was allowed to enter here without permission during its rule. Now it has become from an empty house to a tourist spot. I had a thought that the nobles who built it never dreamed one day it would be trodden by commoners. The Giant Panda house is for me interesting. I pretty much loved the zoo and bird sanctuary at Singapore but this place is still worth a check out. This is home to China's giant pandas. It's a pretty nice place actually.